Leading USA manufacturer of recycling receptacles says that going ‘modular’ is the solution. Buildings that connect together individual recycling receptacles to create a recycling station have some unique advantages that all facilities should consider. Going ‘modular’ is the solution. Recycling receptacles manufacturer Glaro Incorporated recently explained that multi-stream recycling stations made from connecting modular receptacles together will transform any area of your building into a fully functional recycling ‘destination’ that promotes better recycling habits to your occupants. “A recycling station comprised of modular units guarantees that you will have the right capacity, the required streams, and optimal visibility in your particular building while presenting a professional, organized recycling program,” says Executive Vice President Robert Betensky. “Placing recycling stations strategically throughout a building is more effective than implementing a recycling program piecemeal.” Individual receptacles can be used to supplement recycling stations where necessary. A recycling station has much more capacity than an individual unit. The company says that you can get as much capacity as you need. For example, a single unit can be a 15, 23, or 41 gallon capacity. Customers can connect as many receptacles as they would like, although most people connect two or three, according to Executives. “Glaro recycling stations are truly modular. 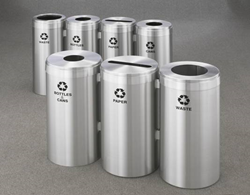 You can use any size and capacity receptacle from any Glaro recycling receptacle line in any configuration you want. As a result, virtually any combination of sizes and types of recycling receptacles can be put together,” remarked Mr. Betensky. Each unit can be matching in color in different colors. A custom order never needs to be placed and customers can get exactly what they want without paying a premium. “What may be considered custom at other manufacturers is standard at Glaro,” says Plant Manager Robert Glass. By connecting recycling receptacles, they become neat and orderly. They will not slide out of place or rotate out of position. As a result, receptacles stay organized and their labeling remains easy to read. Glaro Inc. factory connector holes are positioned according to the recycling receptacle layout and configuration to ensure any combination can be successfully connected. By contrast, individual units will not present as a cohesive unit that effectively encourages people to recycle. “They just don’t make the same statement. Stations are also more architecturally correct than individual units or low end designs,” added Mr. Glass. Every municipality has specific requirements that guide what recycling needs to be collected and how recyclables need to be separated. Modular recycling stations are the solution to this challenge since the facility manager has maximum flexibility in selecting the design, functionality, finish, messaging, and configuration of their receptacles from beginning to end. “Our goal was to make meeting local requirements easy. Going ‘modular’ is the answer,” added Mr. Betensky. For more information on recycling stations, contact a representative at Glaro Inc. by calling 1-888-234-1050 or visit glaro.com. Glaro Inc. is the original USA manufacturer of RecyclePro™ recycling receptacles and recycling stations. Glaro Inc. also manufacturers product lines including bellman and luggage carts, platform trucks, metal trash receptacles, smokers’ posts and receptacles, crowd control posts and systems, safety barriers, signs, sign frames, directories, menu display stands, coat hanging equipment, coat trees, indoor umbrella holders, wet umbrella bag stands, metal planters, and key drop boxes. The company recently launched a line of disinfecting wipe dispensers, FDA approved wipes and coordinating receptacles.